Green chilli (chopped) 2 no. Take the chopped coriander leaves, chopped green chillies, ginger, cumin powder, chaat masala, lime juice and salt in a small blender jar. Add little water and grind to a smooth paste. Add a few more water if required, but don't make the chutney too thin or watery. 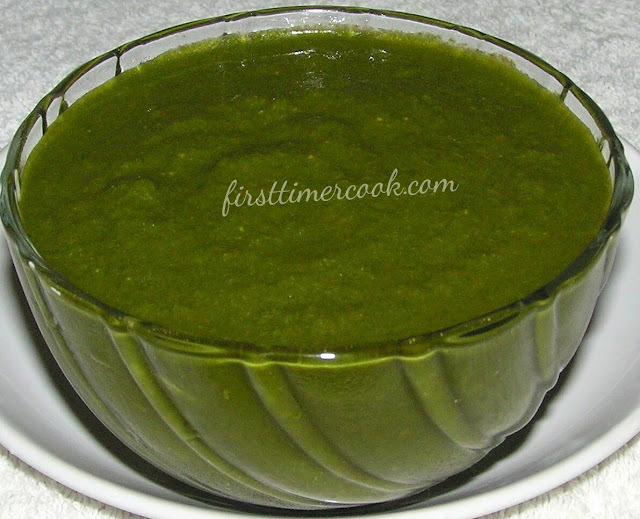 Remove the paste to a bowl and green chutney is ready to serve. This green chutney stays good in the fridge for 2-3 days. Green chutney is versatile and can also be used as an accompaniment with snacks like pakoras, dhokla, sandwiches, batata vada, vada pav, samosa, veg cutlet, any type of chat etc. To make the chutney more spicy, just increase the quantity of green chillies.